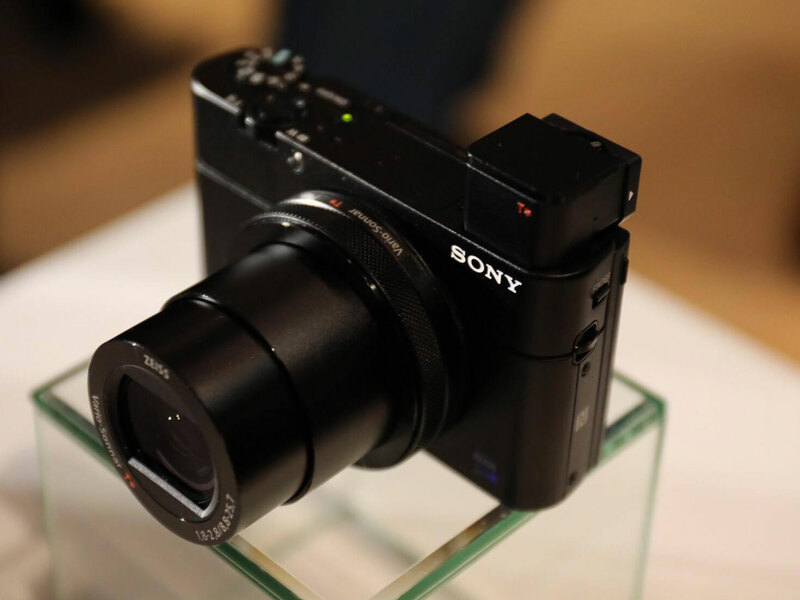 Sony has announced the latest version of its RX100 series: the Mark V. It maintains a 20MP sensor and 24-70mm equiv. F1.8-2.8 lens, but adds phase-detection AF to achieve focus speeds as fast as 0.05 sec, and a front-end LSI to improve speed of operation and buffering. 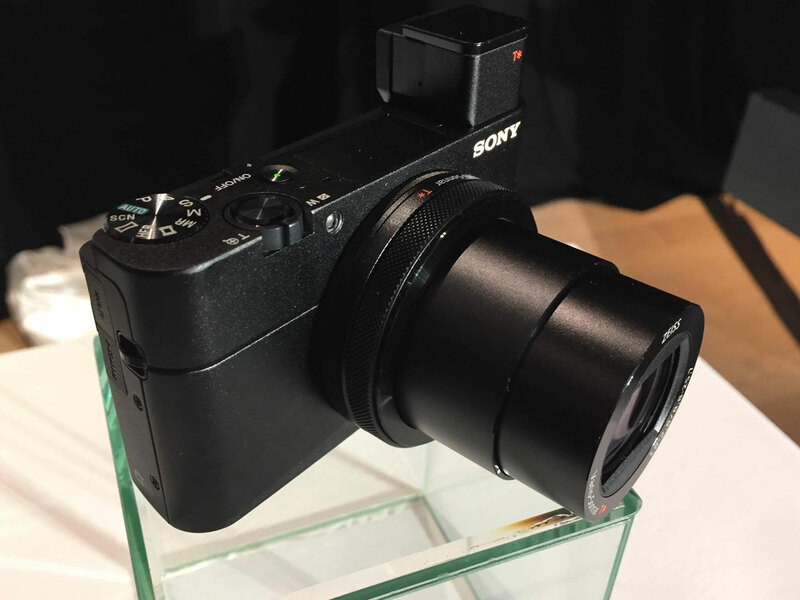 The Sony Cyber-shot RX100 V offers what Sony calls 'professional level AF performance' in the form of a new sensor with 315 phase-detection AF points over 65% of the frame, claiming the world's fastest AF speed at 0.05 seconds. The front-end LSI gives a turbo boost to performance, allowing the sensor to be read faster and more data to be buffered. That means the Mark V now offers 24 fps shooting at full 20.1MP resolution with autofocus and auto exposure for up to 150 frames for Fine JPEGs. That's stills shooting at movie frame rates, folks. Eye AF is also available in AF-C mode. The Mark V's video is also improved. It creates UHD 4K from a 5028 x 2828 pixel region. 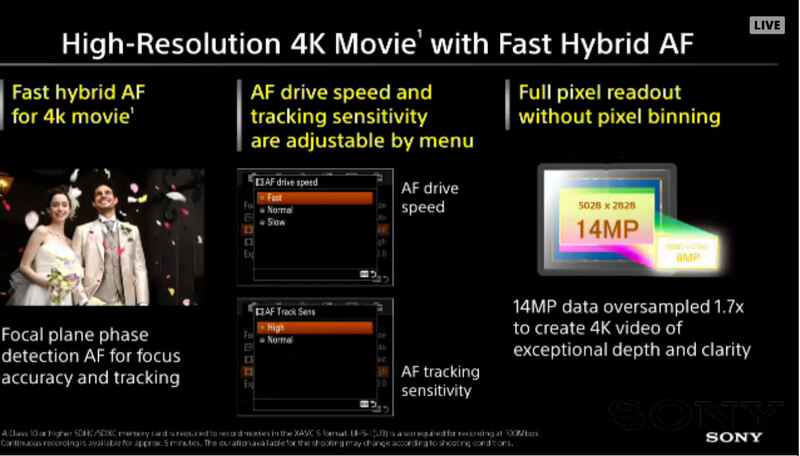 This means it oversamples by 1.3x in each dimension (1.7x overall), to give highly detailed 4K footage. The faster sensor readout thanks to the LSI also means less rolling shutter in 4K video and electronic stills, inching these cameras ever closer to the global shutter ideal. The camera maintains the ability to use its phase detection AF during video shooting, but no touchscreen severely reduces usability. 960 fps and all other slow motion modes are now available with twice the recording duration of the RX100 IV – up to 8 seconds of 40x slow motion at 960 fps. S-Log2/S-Gamut and Picture Profiles are also available to videographers, as is 1080/120p. The camera's 3" 1229k-dot, non-touchscreen LCD tilts a full 180 degrees upward and 45 degrees downward. It retains a pop-up viewfinder, with a 2.4M-dot OLED panel. Wi-Fi is available as expected, with the added benefit of being able to read QR codes to help make a wireless connection when NFC isn't an option. A new underwater case is available, compatible with the entire RX100 series and making it possible to use the camera up to 40m underwater. It will be available in October for $1000/€1200. NEW YORK, Oct. 6, 2016 – Sony – a worldwide leader in digital imaging and the world’s largest image sensor manufacturer – has today announced a new flagship model for their popular Cyber-shot RX100 series of compact cameras, the RX100 V (model DSC-RX100M5). The exciting new camera brings a new level of AF performance and speed to today’s compact camera market. It is equipped with a Fast Hybrid AF system with the world’s fastest AF acquisition1 at 0.05 seconds2 and world’s highest number of AF points on sensor1 with 315 points covering approximately 65% of the frame. The camera can also shoot continuously at speeds of up to 24 fps3 – the world’s fastest for a compact camera1 – at full 20.1 MP (approx. effective) resolution with AF/AE tracking for up to 150 continuous shots4. The RX100 V is equipped with a newly developed 1.0-type stacked Exmor RS™ CMOS sensor with a DRAM chip, a ZEISS® Vario-Sonnar T* 24-70 mm5 F1.8 – 2.8 large aperture lens and an enhanced image processing system with a new front-end LSI chip that maximizes processing speed, expands the memory buffer and optimizes image quality, in particular at high ISO settings. The camera also features 4K video recording with full pixel readout and no pixel binning6, super slow motion recording at up to 960 fps7 with extended recording time and more. A first for Sony’s RX100 series of cameras, the new RX100 V model features a Fast Hybrid AF system that combines the respective advantages of focal-plane phase detection AF and contrast detection AF and ultimately enables the camera to lock focus in as little as 0.05 seconds2. This high speed focusing is a perfect complement to the 315 dedicated AF points that cover 65% of the sensor, and ensures that shooters will be able to capture their intended subject with high speed and accuracy, even if it’s moving rapidly in unpredictable directions. 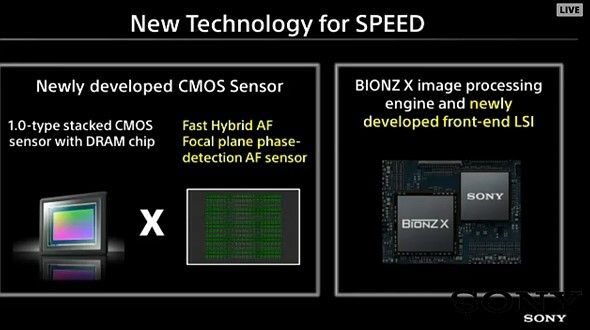 Additionally, processing speed has been greatly enhanced through the addition of a front-end LSI that perfectly supports the camera’s BIONZ X® image processing engine. These two components combined with the powerful AF system allow the camera to shoot continuously at speeds of up to 24 fps 3 at full 20.1 MP (approx. effective) resolution for up to 150 shots4 with AF/AE tracking. Viewfinder blackout between shots has also been minimized in this high-speed shooting mode, which greatly improves photographers’ ability to follow fast action and capture the decisive moment. Silent shooting is also available in these high-speed modes as well8. 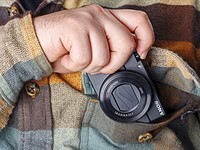 Other advancements to AF performance on the new RX100 V include the addition of AF-A mode, which allows the camera to automatically switch between continuous and single-shot AF modes. Users can also manually select if they’d like the continuous AF and phase detection AF areas to be displayed live on screen while they are framing a shot. The RX100 V also has a high speed Anti-Distortion Shutter (maximum speed of 1/32000 second) that minimizes the “rolling shutter” effect commonly experienced with fast moving subjects. This fast shutter speed also allows the camera to capture sharp, crystal clear images with a wide open aperture at brightness levels up to EV199. Shooting at wide aperture with the fast shutter speed allows photographers and videographers to capture beautiful content with sharply focused subjects and defocused backgrounds under some of the most difficult, bright lighting conditions. New on the RX100 V, users can freely select the initial magnification ratio when shooting in a mode with Focus Magnifier, and can select between “focus point” and “center of display” for the location of Focus Magnifier. The pocket-friendly RX100 V is packed with a variety of video capabilities that will satisfy even the most demanding video enthusiasts. With Fast Hybrid AF, the focal plane phase detection AF sensor ensures accurate focusing and tracking performance, even for the severe focusing requirements of 4K movie shooting. AF drive speed and AF tracking sensitivity can also be adjusted via the menu system, giving shooters plenty of flexibility based on their focusing preferences. In 4K mode 6, the new RX100 V utilizes full pixel readout without pixel binning to ensure that all the finer details of 4K video are captured with minimal moire and ‘jaggies’. These high-quality results are achieved through use of the XAVC S codec, which records video at a high data rate of up to 100 Mbps during 4K recording and 50 Mbps during full HD shooting10. Additional professional caliber video features include Picture Profile, S-Log2/S-Gamut, 120p HD Full HD mode and more. Users also have the ability to manually select a frame from a recorded movie and save it as a still image file of approximately 8 MP during 4K shooting or 2 MP during HD shooting. The RX100 V is able to record super-slow motion video7 at up to 40x slower than the standard rate, and can do this for about twice as long as the RX100 IV model. This extended time allowing users to capture a series of high-speed, fleeting moments of action with incredible detail, resolution and clarity. Prior to shooting, users will have the ability to choose among 960fps, 480fps and 240 fps frame rates and among 60p, 30p and 24p playback formats to optimize the recording to fit the speed of the moving subject, with the option to use the movie record button as a ‘start trigger’ to begin recording once button is pressed or ‘end trigger’ to record footage up until the button is pressed. The new RX100 V maintains the convenient pocket-sized design of the remainder of the RX100 family and is equipped with a high-contrast 2.35 million dot XGA OLED Tru-Finder™, ensuring true-to-life image preview and playback functionality. The EVF conveniently retracts in and out of the camera body based on user preference, and features optics with ZEISS® T* Coating. The new camera is also Wi-Fi® and NFC™ compatible and can access Sony’s growing range of PlayMemories Camera Applications. Learn more at www.sony.net/pmca. Another convenient addition is the ability for users to freely set the leading three characters of saved file names for easier sorting and organization. There will also be a new underwater housing (model MPK-URX100A) that will be available as a separate accessory for the RX100 V and all other RX100 series cameras. Designed exclusively to fit the RX100 cameras, the housing features a depth level of 40m/130ft. The new Sony Cyber-shot RX100 V (model DSC-RX100M5) compact camera will ship this month for about $1,000 US and $1,250 CA. The new underwater housing (model MPK-URX100A) will ship in November for about $350 US and $450 CA. Both products will be sold at a variety of Sony authorized dealers throughout North America. A variety of exclusive stories and exciting new content shot with the new RX100 V camera and other Sony products can be found at www.alphauniverse.com , Sony’s community site built to educate, inspire and showcase all fans and customers of the Sony α brand. Sony, please give us another RX100 model with slightly better zoom range, as with the RX100II. What about a 28-135? So Dpreview, how about testing and reporting on this camera's timekeeping performance? I've had two of the RX100s and their clock accuracy is atrocious, mine both lose about a minute a month. If you use an external GPS for geo-tagging (which is orders of magnitude more accurate than any built-in GPS that I have seen) you are totally dependent on the accuracy of the time-stamp, the application matches that with the similarly time-stamped location in the GPX file. Yes, there are workarounds, setting the clock regularly or (more simply) photographing the time displayed on your GPS receiver's screen after each outing and adjusting all time-stamps accordingly - but clocks should keep accurate time. This may be a dumb comment, but I like the 'look' of a large, completely round front lens element. Like bigger wheels on a car, it may not really be necessary, but it has a more competent appearance. And, is a filter thread unnecessary on a camera like this? Compared to my RX100m3, the only attraction is 4K video. However, unstabilized handheld 4K video is a jello-filled, sick-generating nightmare. Thankfully, the 4K video on the RX100 V is not only insanely detailed, but it's now almost completely free of rolling shutter - so you won't have as much jello as before. Oh. that's new. It might be worthy trying. Sorry I jumped to conclusion based on my experience with the mark IV. No problem. We're actually hoping to do a side-by-side rolling shutter test for the full review. At 1" sensor who needs fast AF when everything is in focus. There are still people who falls for this marketing ploy. - I stopped counting pixels, have anyone of you? - Can anyone tell if it is stacked or not? What a nabob of negativism! Ha ha. Yeah, he's pretty negative, isn't he? He's also wrong, because this camera has an f/1.8 to f/2.8 lens that is more than capable of throwing subjects out of focus. Sorry, 3840 is NOT equal to 4,000 so it's not truly 4K, is it? 1920 is not equal to 2,000, so it is not truly HD? We've all bought the lie. But real 4K as defined by the Digital Cinema Initiatives group—made up of the major studios—is 4096 × 2160. The 3840 spec is for television viewing. Basically it all comes down to whether you're a creator or a consumer. Creators accept nothing less than 4096; consumers settle for 3840 standard. I do wish Sony would introduce a touchscreen for the RX100 series. I won't buy one until they do. Same here. Touch-screen is inevitable if they intend to hold this market segment, and I just know the moment I part with an M5 sized pile of cash the M6 will come along. With touch-screen. Meh. Lexo Lexo: That doesn't make any sense at all, as you could simply turn it off. So you turn off the touch screen. How exactly would you control the camera? Honest question. I presume they would get rid of most physical buttons to accommodate a touch screen. toughluck: No need at all to get rid of the buttons. It could have the same controls as it does now, just with the addition of a touchscreen so you can use that if you prefer. Touchscreens are great for things such as moving focus points and navigating menus. They are also a great backup if any of your physical controls stop working. My current camera, a Panasonic GM5, has a broken scrollwheel but I can still use the touchscreen for controlling aperture, etc. But then there's no point adding a touch screen. As far as I saw, adding a touch screen is typically accompanied by removing physical buttons, it happens with everything -- phones, cars, etc. toughluck: It happens with cars and phones, but not with cameras aimed at professionals and enthusiasts. As already mentioned, a touchscreen gives options for controlling functions such as focus point. Most people find this to be useful. A very small minority of people are opposed to touchscreens, but as long as physical controls are retained this objection is pointless as it is always possible to turn off the touchscreen. Only 315 AF points? What a joke! Unless it comes with 60,000 AF points, no buy. Sorry Sony, you should have tried better! Made in China! I had the Mark III, dropped it, (not from very high) & it completely fell apart! I now shot with Fuji! Drop 100 of each camera from the same hight and see how many of each brand survive. Statistics 101. I didn't even know Fuji made guns! China has more sophisticated and fairly stricter manufacturing fabs and processes than Japan. You should be worried if your camera was made in Japan. I read somewhere else that it DOES have a touchscreen? I use my RX100iii mostly for video. The stabilization is one of the best I have used. It is great in low light for plays and concerts. This is where I use it the most. The new one should be even better. Most venues won't let you bring in a DSLR and the RX100 always gets past security. I always carry a few extra batteries and they are so small it is not a problem. This is where I see the greatest value in this style of camera. Are you satisfied with the video quality in low light situations when viewed on a television? I'm interested in this series but have never had one. low light is decent if you are trying slow mo. Slow mo best suited for bright lights and really bright lights. but its where the fun is. ANd sits in your jeans pocket. Infact perfect for travelling. So after 10 bursts of 1 second the battery will be drained? One is being specifically modified for you. The battery will be dead after ten bursts. Guaranteed! The price is too high for pocket cameras. Yes, I know RX100 is good cameras. 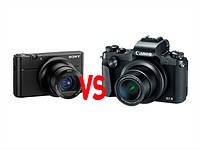 and when Sony will use new sensor which work better on low light ? Why have they never added a grip? So simple, so cheap. All the RX100s have been as slippery as a bar of soap. And fully articulated screen, ....for that price, it is about time to move forward from the less functional tilt screen. One thing that is not mentioned about these cameras (this is true of competing Canons too) is that they are huge dust magnets like nothing I've ever seen. Just carry it in your pocket a couple of times to see how much dust and particles get stuck inside the lens. It's the main reason I don't mess with the compact 1" sensor cameras anymore despite the decent image quality. Never had a problem with dust with mine. I do carry it it the OEM case most of the time. Perhaps you have really dusty pockets? Turn your pockets inside out when you wash them. You must have really filthy pockets! Seeing Sony's aggression and keep answering their customers, I often think what Cankon are doing. They are making friend with Kodak. LOL, simple but well said. Don't forget Sony can afford to be aggressive they don't have other product lines that can be eaten into. Once they have a stable market share you'll see trickle innovation from the top to bottom. They're already doing it with the a6500, a6300 and a6000 which are all on sale at different prices. Canon are just selling cameras quietly, day after day. Have you heard, they increased market share in a down market and are now very close to 50% market share? People vote with their wallets and they are voting Canon. Things are really heating up in the 1" compact segment. I've changed my plans for my next advanced compact numerous times from this fall's announcements. First I thought Nikon DL, then Canon GX II, then Panasonic LX10. Now this...but I think I'll stick with the Panny when it ships. Poor Nikon, they're just not going to get a piece of this action if they can't get out of a 1-year shipping delay. What keeps me hopeful about Nikon's DL series is the 18-50. That covers my most used focal length range for casual shooting, and wider. Sony and Panasonic are in a reactive feedback cycle regarding video usage in their markets. Both companies know there is a reasonable market of people who want high quality video in a small package, often with professional or semi-professional use, so they increase the video capabilities of their cameras with each iteration. Right Archiver, that 18-50 is one place where the Nikon DL might get away with competing late without a discount. These other new 1-inchers tend to start at 24mm equivalent., so the 18-50 variant of the DL will be able to exist in its own wide-angle niche, and it's tempting. Will the next ones be so powerful they can only take 1 picture ? Yes battery life has gotten a real PITA. 220 pictures battery capacity is a pretty big flaw, and not very convenient for the type of photographer this is aimed at. Actually the more I look at the whole feature set, the more I realize how much this camera could be crippled by its battery life. And the next one will be able to take only 1/2 a picture on a battery. I get about 400 stills on one battery if I don't chimp. Battery life goes down dramatically when I shoot vids. Personally I don't see this as an issue at all. I got the III, and bought a handful of extra batteries being very pessimistic. But when you do not use flash, and seldom video and EVF, you get on the good side of 1000 per battery, And frankly I would not see it as a problem if it was half that, if that came at the price of improved features. The batteries are easy to carry in any pocket, and can be changed in seconds, so MUCH better than a larger and heavier camera+battery combination. It is just a matter of getting in the habit of swapping the battery, before it reaches zero, so you do not risk missing that 'crucial' moment. I use external chargers anyway, so even if the capacity was even larger I would still swap between at the least two. On my Olympus Stylus 1, the EVF draws much less power than the screen. I found this by setting the camera in playback mode, running a slideshow endlessly until the camera automatically turns off. Result : about 6 hours 40' using the screen, 9 hours using the EVF (default brightness for both). Is the camera designed so the 4k video overheating and battery depletion happen at the same time? Perfect time to change the battery. Even better if it has a countdown clock. 1 minute to camera shutoff. 30 seconds to camera shutoff. Do away with the screen and save the juice. Put the card into your iPhone dongle if you just have to look at them before you get home. Simplify! Still no touchscreen (why!!!??? ), same shameful battery life as other nowadays models (2007 compact cameras could easily take over 1000 photos), and that european-cash-cow price in comparison to America price, as if it was not already overpriced enough... RX100s will stay out of my wish list. I think if they added a touch screen it would completely kill the battery life. You are probably right, but then they should have added a touch screen AND a bigger battery. It needs a bigger battery anyway. And to make the bigger battery fit there could be just a bump on the front, maybe that bump could be used as a grip by the way, and it would not even make the camera really "bigger". One silly detail they really ought to fix on the RX100-series is the manual double action needed to both pop up&out and in&down the EVF! At the very least some simple spring mechanism could make it pop out too. It is more complicated to do the reverse in one motion. One solution could be something left of the EVF that popped further up, and was directly coupled to the pop out part, so pressing this down would first put the EVF in and further pressing would put the whole thing down. And if they please please please could add some info of the current focus distance. It is not always easy in either EVF or on screen to see if it got the focus right. The lack of a touch screen is rather disappointing considering that Sony have finally added one to the A6500. Wow... so one can potentially film 6k raw at 24p for a good 6 seconds per clip, I am interested! $1000/€1200 ? OMFG...what has the world come to ? 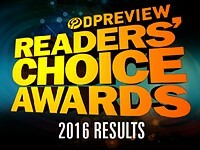 Expect that trend to continue, as vendors will focus more and more on the advanced amateur and pro markets. Cheap photography is possible with any phone nowadays. Agree.... however there are plenty of good rivals around (maybe not as good) but does the job fine like Canon GX, Pany, etc and much cheaper. Lx10 for me. Sony controls and no touch screen is a no go for me. The question is whether it still limits 4K for 5 minutes. 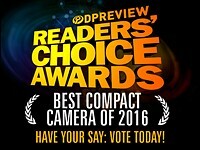 If yes, the Panasonic LX10 would be a better choice if one does not care EVF and wants to save $300. Wonderful camera and I may well upgrade from my M1 which is still going strong after heavy use the last couple of years. I am wondering about pricing though. Camera prices are just stupid here in Canada. Currently the M4 sells for $1249, the M3 for a little over $1000. The M5 is listed for pre-order at $1249, same as the M4. What gives? Is pricing of the older cameas going to be adjusted? Which reminds me: Whatever happened to those DL Nikons? DL is simply dead. Who will care about the forever delayed Nikon DL after the Sony RX100 V and Panasonic LX 10 have come to the market? They may get them out in 2017 and if the price stays as quoted and deliver good images and Video then along with other rivals should put more pressure on Sony to reduce prices downwards - especially if the sales are taken up by rivals and Phones can deliver some good results. DL has been suspended probably until early next year, the earthquake killed any chance of a 2016 release. One can only hope they are using the time to further improve the cameras and will add some more lens options. So DL is not dead, but Nikon is certainly not making sensible decisions in other areas. Sorry coody, but I still care a lot. Especially for the announced prices. And there is still no equivalent for the 18-50. The Nikon DL team dived in to the deep end with 3 new disciplines simultaneously and with no experience and never surfaced again. Hardly surprising really. I'm astounded people still manage to complain. I already have the IV and I'll still be buying this one. It's a no brainer. People demanding perfection and every feature they want, but not the ones they, personally, don't want, blah blah blah. Sony has to save things for the VI. And reality will keep some things in check if you want to keep the form factor. But while other options may be better depending on individual tastes and needs, if you want to cover the most bases with everything but the kitchen sink, I believe this is the only game in town. It doesn't compete with other makes. The V competes with the I - IV. Deal with it. probably not the specs they are complaining about but the price as compared to competitors - even though the cameras may not be in the same league. I suppose I've come to accept that if you want that last extra 10%, be prepared to pay much more than 10% for it. But do note that the complaints below are not limited to price. What is the last 10% exactly in this case, the lack of touchscreen maybe? You're funny THX (assuming you're American and familiar with the old adage I mentioned). If you think there's a better camera with similar dimensions, a touchscreen, and better price -- buy it. You're even funnier, so only Americans know that old adage, Damn, thank god for America. There's no reason to feel angry over a camera is there? I'm not familiar with the sayings of every country in the world so I don't assume. If, however, you're an American, I expect you to know the old saying -- applied from cars to technology -- you'll pay a lot more for that last little bit of performance. Why this leaves you frustrated is a mystery. But please, don't explain. There are some things I just don't need to know. edit: followed the link, and it looks like a nice and compact housing. Is the mark IV prices going down or it will be extinct? Because as is, doesn't make any sense to buy the IV. Doubtful, they just keep introducing new versions at a higher price point, keeping the previous version the same price. They're still selling the mk1 version! But the issue here is that the IV is the same price as the V.
I recently bought the G7X Mark ii (on back order for 1-2 months) for $600, but I'm contemplating if I should cancel and purchase this instead. Any suggestions since this is my first point and shoot camera? I'll mainly be using it for travel. Play with a mark IV version in the store. The Sony is a very capable camera, and produces great pictures, but I didn't like the experiencing of using it. To me it just feels too much like an electronic gadget that happens to take pictures, rather than a camera. The zoom ring is laggy for example, you can definitely tell it's "drive by wire" and not a direct control. And the UI is horrible, and still no touch-screen. For many people that's not an issue, it's a personal opinion. I'm used to the directness of my Fuji and M43 gear. The G7X Mark ii is an excellent camera. Very fast, good exposures and it works much like a Canon DSLR with it's modes and menus. This was my biggest complaint about the Sony RX cameras, is that there are too many modes, too many auto modes, to much that the camera does in processing such as DRO, HDR, and all other sort of things. I always felt out of control where the camera was doing all kinds of analysis and processing, and taking over from my ability to know what I'm going to get. Maybe It's just me, but I had 3 of the Sony Cameras and none were as good as the G7X Mark ii. I've owned 3 Sony cameras, and I'll never get another. Unless I'm shooting more video. They seem to be targeting a video niche and from the sounds (and looks) of it, the video quality is excellent. RX100 series is a milking cow for Sony. Possibly a best selling compact ever, encapsulated in pretty much same body. Good specs, a huge following and lack of real competition makes RX100 series a sales winner. The only sour grape would be ever escalating price of every new model. This is $1000 so prices are not escalating. The other 4 cameras will now have price DROPS. One other sour grape is that no other cameras have any respect or place on the Sony Cybershot Forum. We'll correct that. It definitely does not have a touchscreen. that's disappointing for the price..
Specs have been corrected. A bit of confusion on my part. No touchscreen is a deal breaker for me. I'm happy to hold on to my mark iv a bit longer. @IdM photography -- if you use an up-to-date smartphone you'll see the fingerprint issue has been mitigated significantly by newer glass manufacturing technology...to the point where it's almost moot. And with so many focus points on the V, a touchscreen would be much easier to use than a joystick/wheel. Wow! A new processor and it's an upgrade. So we can happily spend money on already fifth generation. Not. Still the daddy. Glad they basically retained the original overall design. I think price got up, actually. Yes, except for the viewfinder there is no viewfinder. Hasn't looked at a RX100 since the first! Next! this made me laugh.. why would you need a viewfinder when you obviously cant use your eyeballs to spot the viewfinder in the photos. @HRC2016 umm...I think YOU need a new viewfinder. LOL. Hey, where is the Rx10 III then....more Mark's for the little one? Does the camera have an ND filter? How about a time limit on 4K? Perhaps I missed it, but I didn't find the info in the above narrative. I have the M3, and use it mostly for video. Apologies if I just didn't read the info close enough. There's a tweak online that enables unlimited recording time. there's a built in ND feature. But can I make phone calls from it? That will be in the mark IV. Wow. This might get to my shopping list. So far I have been dissatisfied with the AF speed of the previous versions. Great announcement. Disclaimer. A Canon FF shooter. Love my Mark IV, but the 3 stop ND filter makes no sense for video when their S Log 2 mode starts at 1600 ISO! a 6/9 stop makes more sense so you can achieve shallow depth of field outside. I find that the 3 stop means I'm still shooting video at F13 and having highlights blown! Come on Sony, think! NDs are for filmmakers, filmmakers shoot LOG, LOG starts at 1600 ISO, so 3 stops is too weak! the Slog at 1600 is grainy as hell - unusable. its just a marketing propaganda. Not true! It's beautiful.. you just have to grade it obviously. The grain is very organic looking and cinematic on Sony cameras. I tried it, graded it (duhh), and it is useless. Uhhh... 24fps jpg+raw is basically cinematography sound-sync speed. Reduce that to just jpg and you might be able to shoot longer sequences of 20mpxl stills which begs the question about whats next in their pro video cameras??? exactly. I don't think that 24fps number was a coincidence. RAW video in your pocket is a game changer! But Sony knows this is also niche so they are not trying to sell it as such. No mention of 4K video recording time limit? A little ominous i fear. The Mark IV was limited to a paltry 5 min per clip and had bad overheating issues when shooting in 4K. I was hoping Sony would address this rather embarrassing limitation. (See any Panasonic 4K cameras all 29 mins or unlimited) anyone out there see any info on this? "Able to record UHD 4K video at 30/24 fps for up to 5 minutes, the RX100 V is a pocket-sized powerhouse, delivering movies with exceptional clarity." @Squee - Thank You! - Wonder why Sony can't seem to fix this embarrassing limitation? Ill stick with my Panasonic ZS100 and it's unlimited 4K recording time. I think it's a matter of temperature management. 4k recording usually results in overheating if they downsample? If you're set on investing in a seriously capable compact, no doubt these two cameras will be on your list. Here's how they square up.